The humble pregnancy test just got high tech. As if our children won’t already be more technologically-savvy than us by the time they’re out of nappies, now their every move before they are born will be tracked using a pregnancy test the syncs with your smartphone. The over-the counter Pregnancy Pro test delivers the results of your urine sample straight to your phone. As soon as there is a bun in the oven (and even before) the test will sync with your smartphone to provide access to an app, offering information and support tailored to you and your growing bub. Bluetooth-enabled, the test can offer mums-to-be around the clock cycle and pregnancy support from their mobile. The app, developed by First Response, can forecast your next period, calculate your most fertile days, estimate how far along you are and predict your due date. And while you wait for those life-changing results, the app can take your mind off things with calming imagery, entertainment or give you the chance to cram a bit more info in there about pregnancy and all the fun that goes with it. 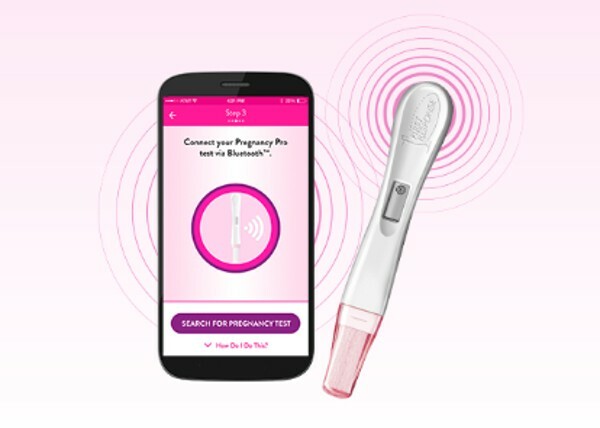 The Pregnancy Pro digital pregnancy test is not yet available in Australia, but you can still download the First Response tracker app from the company’s Australian site to track your pregnancy. If you do get the result you want, read here for the very best ways to announce your pregnancy.